Being the first game in the series, Sonic the Hedgehog went through many ideas and changes during the development process. What follows is a summery and collection of those items. A collection of images of Sonic the Hedgehog drawn during the creation of the first game. From the Sonic the Hedgehog Material Collection. In the mid-1980's, there was no question that Nintendo had overtaken the videogame market. With its Famicom system in Japan and the Nintendo Entertainment System in the west, the 8-bit powerhouse defined an entire generation of gamers. Though Sega had received marginal success with their first mainstream videogame console, the Sega Master System, it was unable to compete with the device that had saved the industry in America. Wanting to be known for more than just their arcade hits, Sega was not ready to give up on the console market, releasing their entry into the 16-bit wars in October of 1988 in Japan. The Sega Mega Drive, renamed the Sega Genesis when premiering in the United States the following January, was Sega's bid to become a major player in the gaming world, in the hopes of usurping the house that Mario built. However, the executives of the company knew there was still an essential element missing from the equation that would push them beyond both the NES and its upcoming successor, the Super Nintendo. 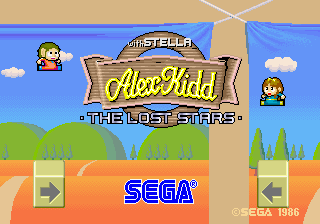 During the Master System's tenure, Sega had poised Alex Kidd as the company's mascot, releasing a handful of games in that franchise. However, the character never gained the momentum they had hoped for. Realizing the importance of having a strong, central figure to embody what they wanted to accomplish, Sega began an internal competition across all of its branches to create the company's answer to the Super Mario Bros. series. For months, numerous character designs were drawn up by an untold number of people, ranging from American wolves to overall-wearing chickens. One of the men who actively submitted characters to the contest was Naoto Ohshima, a designer who had previously worked on the Phantasy Star series. Early on, Ohshima sketched up a plethora of potential headliners, including a rabbit, a mustached-man in pajamas, and a scribble of a hedgehog. The initial favorite was the rabbit, who would run through levels picking up items with his ears and throwing them at oncoming enemies. After some initial discussion, Ohshima approached Yuji Naka to collaborate with him on the project. An up-and-coming programmer, he had previously worked with the designer on the first two Phantasy Star titles. Having freshly come off of a robot-based game that had been cancelled early on, Naka was eager to get back to work, and soon the two men began discussing just what the game could evolve into. One of the aspects that intrigued Naka most was the inherit speed in the game's design. Even as a young child, Yuji Naka had been transfixed by fast cars including the Ferrari line, and after getting into the games industry wanted to capture that feeling, something that a platformer had not yet accomplished. As the earliest form of the engine took shape, Naka realized that trying to keep the game running smoothly and maintain speed was almost impossible with the current game mechanic. Having to stop and pick up items broke the flow, especially since the team wanted to keep the controls simple, having to use only one button as opposed to Mario's two-button scheme. Luckily, they wouldn't have to tackle the problem alone, as another employee at Sega would soon join their racks, Hirokazu Yasuhara. Yasuhara, who would become the Director and Game Planner of what would become Sonic the Hedgehog, was no stranger to the group, having collaborated with Ohshima on the title Final Labyrinth. The first problem he knew they had to tackle was the attack mechanic, realizing if only one button was at their disposal, they needed to combine the jump and attack into one swift motion. Discussing with the other two, they came to the conclusion of having the character himself become the projectile, curling into a ball and able to attack enemies from any side. The rabbit was quickly cast aside as thoughts turned back to Ohshima's other conceptual drawings. While the man with the mustache was still a favorite, it was clear he would not be appropriate for what the game called of him. Instead, they looked at an armadillo sketch and that quick scribble of a hedgehog. As the spines of a hedgehog gave off the illusion of speed, gave off a more urgent sense of attack as opposed to an armadillos shielding, and that it was humorously ironic that a slow creature could break the sound barrier, Ohshima began to rework the character into something that could be turned into the company's mascot. An early promotional drawing of Sonic. Featured in the Summer 1991 issue of SPEC. The character, originally called Mr. Hedgehog, was from the get-go meant to not only be a reflection of Sega, but an embodiment of the best the United States had to offer. At the time, it was believed that if a franchise was to become popular in the west, it would automatically succeed in Japan as well. Taking inspiration from classic animation with its simple curves and large, expressive eyes, "Mr. Needlemouse" was styled after the likes of Felix the Cat and Mickey Mouse, slowly morphing into "The Most Famous Hedgehog in the World." While the blue hue of the character was directly drawn from the color of the company's logo, the splash of red and white found in the shoes was inspired from one of the most famous American creations of all - Santa Claus. The physical design, buckle and all, was drawn from the look of Michael Jackson, one of the biggest pop stars of the 1980's, and his footwear visible on the Bad album cover. Finally, the "get-it-done" attitude the creators wanted reflected in the hedgehog was drawn from a rising star in U.S. politics, Bill Clinton, who was at the time Governor of Arkansas. With all these elements merging together, and receiving a name change, Sonic the Hedgehog was born. These changes were not initially told to higher-ups at Sega, who still thought the AM8 division was working on the throwing-rabbit game. When time came for the small number of development teams to present their game proposals, no one knew exactly how Sonic would be received. It was this reason that Ohshima decided to go the extra mile to help sell the character of Sonic. Earlier, during a brief moment of relaxation, Ohshima had gone on vacation to New York City. Armed with his many conceptual drawings including the mustached man and the blue hedgehog, Naoto culled the opinions of passers-by in Central Park, asking which of the group he held they preferred. Sonic clearly being the winner, he planned to use this as proof of Sonic's appeal to a mass audience. Not content with just anecdotal evidence, the team also consulted with Sega's marketing department, producing an early Sonic the Hedgehog plush that would be used during the pitch. Showcasing Sonic's marketability, coupled with the strength of the game, AM8 was given the green light. Work on the game began in April of 1990, the mythology of Sonic being actively worked on in tangent with the game engine and design. Originally, Sonic was meant to be in a rock band, have a human girlfriend, and fight off monsters and a certain egg-shaped man dressed as a bumblebee. It was over time that many of these elements were streamlined or removed altogether, the team instead focusing on building the world of South Island, the game's locale. Even if the world they were building was to be visually stunning, Ohshima knew that a protagonist was only as good as the villain they were fighting, something evident in the American comic books that he adored as a child. Going back to the one design that seemed to never quite make the cut, the mustached man, Ohshima began working on simplifying the design. Wanting to create an antagonist that was simple to draw for young kids, the original pajamas the character wore and even the brief bumblebee clothing was replaced by a black, red and yellow ensemble. With that, Dr. Eggman was born, set to terrorize Sonic and his animal friends. The tour poster for Dreams Come True in 1990, officially unveiling Sonic the Hedgehog to the world. Sonic's first public appearance was at the Tokyo Toy Show in June of 1990, showing off a tech demo of the earliest form of Sonic the Hedgehog. After that, media for the game went quiet, Sega of Japan instead showing off the character in other ways. In the November 1990 issue of Sega Players Enjoy Club, a brief "interview" with Sonic was published, establishing his attitude and his birthplace of Christmas Island. The feature also served as a way to introduce the musician behind the game, DREAMS COME TRUE's Masato Nakamura. Already an established and successful musical act, Nakamura was hired to compose the tracks that would pepper the game. Using the level concept art drawn by Ohshima as inspiration, Nakamura treated the score like he was composing music for a film, wanting the notes to evoke what was on screen. Though the sound chip could only produce a limited amount of channels at once, Nakamura saw this as a challenge, needing to be careful in his construction of the music, his inspiration creating the unique score that would further define the world of Sonic. Wanting to capitalize on the fact DREAMS COME TRUE was involved with their game, Sega became a primary sponsor for their 1990 tour, the image of Sonic stamped throughout the posters and tour buses the pop-group would use. Work on the game continued nearly non-stop, the 11-month production cycle unheard of for games of the era. One of the core elements, the game engine, was continuously tweaked and altered during this time, in order to make Sonic and its momentum-based physics work, with even Sonic running through loop-de-loops becoming an algorithmic frustration. The limit of what Sonic's speed should be soon became a point of contention, Naka pushing the engine more and more until even he found himself nearly getting motion sickness from the pace the game moved at. Working diligently, Yuji Naka strived to find the right balance of motion for the character, one that would emphasize the speedy nature of the gameplay while at the same time being slow enough so anyone could pick up and play without being overwhelmed, that balance including making sure the animations for the hedgehog looked and flowed naturally. As the engine became solid and the visual style of the world grew, Hirokazu Yasuhara sought to create an experience that did not appeal to just one particular market. Knowing that the west was more interested in challenging obstacles while the east tended to be more casual with their mainstream gaming, Yasuhara wanted to make a game that balanced both of those qualities. Careful consideration was put into the construction of each unique zone, Yasuhara working on the level design of every act. The one level that was recreated time and time again was the Green Hill Zone, taking half a year until it reached a nearly complete state. As this was the player's first exposure to what Sonic the Hedgehog was to be, it was imperative that it have a careful balance of challenge and fun, also tying into Naka's philosophy of being able to better your time and skill through subsequent playthroughs. As the 8-strong team of AM8 neared completion of the program, they dubbed themselves "Sonic Team," after the project that could make or break their company. Conscripting Akira Watanabe to create the distinctive pop-art inspired packaging, plus darkening the sprite of Sonic's shade of blue to better stand out from the blue skies and oceans that was integral to the look of South Island, the final product was nearly formed. A three-part mini-comic, the Sonic the Hedgehog Story Comic, was commissioned to help advertise the game in Japan. Showcasing the world of Sonic, the comic draws from elements during production that were either altered or removed from the final game, including prototype level names and a scene where Sonic is clearly a singer in a band. Developed entirely in Japan, the game would see release first in the west, premiering on U.S. shores on June 23rd, 1991. Some extra graphical effects and a few bugs would be polished for the Japanese release a month later, but it was with this game that the 16-bit wars truly began. Drawing critical and commercial success, Sonic the Hedgehog brought the character - and the company behind it - into the minds of the general public. While there were plans to port the game to both the Amiga and the Mega-CD, it was decided that the game would remain on the Mega Drive for the time being, letting the cart become one of the main selling points for the system. The original pencil sketch for the westernized look of Sonic the Hedgehog, Dr. Eggman, and the Green Hill Zone. From the American promotional comic. While in hindsight its easy to see why the game was a huge success, originally the higher-ups at Sega of America were weary of the concept of Sonic as a character. Though hedgehogs were well known in Japan, at the time hardly anyone had even heard the word in the United States. Michael Katz, the CEO of Sega of America at the time, reacted quite negatively at the initial concepts faxed to his office. Right off the bat, he constructed a list of ten reasons why Sonic would never get off the ground in the west, sending it to Shinobu Toyoda, Executive Vice President of SOA with the intent of having it forwarded to Japanese headquarters. Setting off the western marketing department into full panic mode, they scrambled to correct what they felt was a disastrous decision, quickly contacting another designer whom they thought would be best suited to create a character for an American audience. Whatever plans Michael Katz had were quickly squashed as a shake-up at SOA had him out of a job, replaced by former Matell CEO Tom Kalinske. While acclimating himself to the games industry, he was also faxed the earliest concepts of Sonic, the rock band, and his girlfriend Madonna. Just like Katz, he was put off by the feisty, fang-toothed character, but instead of trying to stop it from happening entirely, Tom looked towards his staff to slightly retool the blue hedgehog. Put in charge of being product manager for the Sonic brand was Madeline Schroeder, whom the offices at SOA affectionately referred to as "the mother of Sonic." Immediately, the first task Madeline and her crew set about tackling was the alteration of the visual style for the characters, all in an attempt to maximize market appeal. Artist Greg Martin was tasked with creating the definitive American Sonic, tweaking the hedgehog while still maintaining a certain level of attitude. The fangs of early concept art were completely removed, the curves of Sonic's proportions becoming softer, more akin to the visual style of late 1980's cartoons. Eggman also received an overhaul, looking far more sinister than what Ohshima's art suggested. This change in tone was reflected further with his renaming to Dr. Robotnik. Next, she cast aside the fiction the offices of Sonic Team had come up with, writing a draft with Director of Marketing Al Nilsen for an alternate scenario to explain how the character came to be. In it, Sonic was born Sonny, a small brown hedgehog whose incredible speed made him somewhat famous in the Nebraskan town he lived. One day, when he should have been preparing to hibernate, Sonny instead decided to continue training in the hopes of one day being good enough for the Olympics, but his natural instincts take over, causing the hedgehog to fall asleep right above the underground laboratory of a crazed yet benevolent scientist. It would be after this meeting that Sonny would become Sonic The Hedgehog, his middle name literally being "The," an idea Al had thinking that it could be turned into an interesting story one day. It was neither Madeline nor Al who came up with many of the western names for the various creatures and creations that would populate the game, however. Game tester and Sega help line employee Dean Sitton was the one responsible for coming up with many of these names, including such badniks as Buzzbomber and Ball Hog (called Beeton and Ton-ton in the original Japanese version, respectively). However, his greatest contribution to the westernization of the franchise was penning the name Dr. Ivo Robotnik. “ The producer of the US version would be in Japan and call in for updates. Like how many rings for a free man...how many rings for a continue etc.. I got to play the game for a week or so and I submitted a document that showed the characters in the game that I could see and a few names for each of them. Dr. Badvibes and many other names were not chosen. I named Ivo Robotnik, Ballhog, and 3-4 more from that game. I helped to flesh out the fiction for Greenhill and Sally/Sandy/Amy? whatever the girls name is now... with a guy named Jamie Wojik... usually producers of games have only to fill in the blanks..it doesn't always matter how the blanks get filled in. While Robotnik was the final name for the character, Sitton had thrown out a handful of other names that could have been used for the antagonist. A westernized version of Dr. Eggman, renamed Dr. Ivo Robotnik. Also thrown about were the names "Mister Badwrench," "Mr. Bad Year" and "Fatty Lobotnik." Even the first name, "Ivo," was suggested by Sitton, pronouncing the name with a soft "I" to make the it sound closer to the world "evil." Although the changes weren't as dramatic as some other Japanese properties marketed for the United States have over the years, the original Sonic Team was quite unhappy when they saw what Sega of America was doing to their work. Years later, Ohshima would go on record saying he was baffled as to why they felt the need to redraw his artwork and come up with concepts that had nothing to do with the game, especially as it had been originally designed with a western audience in mind. To address their concerns, Madeline Schroeder flew out to the land of the rising sun to discuss with the development team why these changes were being done. During the meeting, the Japanese offered a compromise - that there simply be two Sonic's, with the west promoting their version and the east maintaining their vastly different one. However, the representatives of SOA disagreed, stating that if Sonic was to become a global icon, there had to be a degree of unity. Come time for release, the layout and graphics of Sonic the Hedgehog would be constant across all corners of the globe, the only physical differences being the art each package portrayed. Even still, Naka remained blissfully unaware of the alternate storyline until years later, when it was no longer being referred to in any external media. As the game began to take form, the doubts of whether or not Sonic would be a hit began to dissipate, Tom Kalinske wanting to poise the cartridge as the central pillar of their strategy. Meeting with the President of Sega of Japan, Hayao Nakayama, Tom introduced his four point plan to the board of directors, mapping out how they could catapult the Genesis into the consciousness of America. Among the ideas were to lower the price of the system and focus more on games being developed exclusively for a western audience, but the most controversial point was to have Sonic the Hedgehog replace Altered Beast as the pack-in title for the system. At first, Nakayama was nothing less than furious, baffled at how having a core title packed in from nearly day one was going to benefit them, since they were already hitting a loss which each hardware unit sold, making it up in software sales. Kicking his chair to the ground, Nakayama began to storm out, but before he left the room, he turned back to Kalinske and stated that if he felt this was the only way to beat Nintendo, to go ahead. Because of the backstock of Altered Beast-branded Genesis units, the plan was to initially have any new adopters of the system, starting July 1st, 1991, to be able to get a free copy of Sonic the Hedgehog. This would continue until September, when the only Genesis units on the shelves would be those already packed in with the game. Before they'd be ready to roll out, however, Sega of America knew that they'd need a strong advertising campaign close to launch. Holding back on releasing too much media, Sega of America asked their Japanese brethren to also resist showing off too much of Sonic too early, in the fear that if you gave away all your best cards months in advance, people would forget about it by the time the cartridge was on store shelves. Instead, they wanted to begin pushing Sonic only weeks before, having his blue mug plastered on as many videogame magazines as possible. Sonic the Hedgehog going head-to-head with Super Mario World during the 1991 Summer Consumer Electronics Show in Chicago. Though briefly demoed at the Winter Consumer Electronics Show in January of 1991, Sonic's real showing in an American trade show wasn't until the Summer CES in Chicago. With the Super Nintendo's release date only three months away, Al Nilsen came up with a way to show off the game, the natural progression of the aggressive marketing the company had done with their "Genesis Does What Nintendon't" campaign. Gaming journalists and industry insiders alike were not only presented with the full version of Sonic the Hedgehog, but had the game demoed side by side with Nintendo's flagship franchise. Introducing a game that was not yet available in the west, Sega wanted to show that Sonic was not a Super Mario clone, but something new, a colorfully vibrant, roller coaster ride that Super Mario World could only wish it was. Receiving positive press, marketing wanted to emulate the game's showing at the Summer CES on a nationwide scale. Sega of America began a full-on publicity tour in September, dubbed the "Sega World Tour '91," where a mobile unit went to twenty-five shopping malls across the country, having players being able to play both Sonic the Hedgehog and Super Mario World, comparing them side by side. This stark comparison even made its way into television advertisement, a commercial with a salesmen trying to pitch Super Mario World to a consumer who is far more interested in the game playing on the television next to Mario. Similar to Japan's 3-part manga, a promotional comic was commissioned to be published in the west, featuring the Dr. Kintobor story that Madeline Schroeder had helped create. Streamlined from the original draft, the Nebraska elements were completely removed, instead focusing on the chance encounter between a kindly scientist and a brown hedgehog, who would soon become blue. That same scientist, Dr. Ovi Kintobor, would be transformed into the villain of the piece due to an accident involving the Chaos Emeralds and his invention, the R.O.C.C. Though the backstory would be used as the inspiration for subsequent media including the U.K. published Sonic the Comic, the main focus of the advertising campaign would be on the character of Sonic himself, and how he differed from the accepted standard, Super Mario. With all the pieces in place, and Sonic the Hedgehog being packed in with each new Genesis unit, Sega of America's share in the market began to steadily grow. By 1992, the Sonic brand had helped, for the first time ever, to have a company not only compete head to head with Nintendo, but have market share that for a time overtook the gaming behemoth. The following is a collection of images drawn by a variety of people within Sega during the internal competition to come up with a new mascot for the company. Among the selection is the rabbit image, for which served as the original inspiration for the gameplay. While the throwing dynamic was removed from the final product, it was fleshed out for the 1995 Sega game Ristar which contained a handful of members that worked on some of the Sonic titles. The mechanic would eventually be put into Sonic Adventure and Sonic Adventure 2, though it was never a focus of the gameplay and didn't need to be used to finish any of the levels. The concept was also echoed in the much-later character Cream the Rabbit, who would "throw" her Chao at enemies in Sonic Advance 2. Warrior design with two outfits. A third design for the elder warrior. Clown and a young warrior wearing head of a animal. Human character with Bart Simpson-like hair. Robot character and two other characters. An animal of some sort in clothing. Wolf wearing an American flag t-shirt. Side by side comparison of Ohshima's early Sonic sketch with Yasushi Yamaguchi's alternate hedgehog design with more human-like features. The duo ended up coincidentally coming up with the same idea for a hedgehog. Another shot of the human-like hedgehog. Sonic art, the text translates to "Mr. Hedgehog" or "Mr. Needlemouse." A color sketch of Sonic, moving closer to the finished product. A colored image of the final form of Sonic the Hedgehog. The initial drawing of what would become Dr. Eggman. Later concept art of Dr. Eggman, originally envisioned as the protagonist. Dr. Eggman in his final form. A collection of various logos associated with Sonic the Hedgehog. Various artworks of Sonic the Hedgehog intended for promotional use. Another early logo for Sonic. This was used on various merchandise to promote the game. An early sketch of Sonic the Hedgehog, intended for promotional material. An early illustration featuring Sonic, Dr. Eggman, and animal friends, for use on tags attached to merchandise. Concept art of Sonic illustrating his run cycle and speed. Promotional art featuring Sonic, Flicky, Pocky, and Pecky. An early sketch of Sonic that will later become used for the Japanese Box Art cover. A humorous sketch featuring Sonic, Dr. Eggman, animal friends, and badniks such as Caterkiller running through Green Hill Zone. This is a sketch illustrating the ending cutscene of the game. An early sketch of Sonic doing his ending pose that he does at the end of the game. Another variation of Sonic's ending pose. You can see Sonic's band friends jumping and cheering for him in the background. Flyer Concept. The headline says "ill weeds grow apace". Letterhead Concept. The headline says "let's throw away crappy games and love that has vanished in tears". Original illustrations used for the Mega Drive precautions in the Japanese manual. Concept art for various in-game sprite animations. Concept art for unused in-game dancing animations. Sonic, Madonna, and Eggman dressed in a bee-like outfit. Also pictured are various enemy concepts that were ultimately not used. A concept that was toyed around with but ultimately dropped from the final product was the character Madonna. Intended to be a love interest for Sonic, it is unknown just how the dynamic between the two characters would have been if placed in-game. According to Naoto Ohshima, Madonna was meant to be a "male fantasy" by chasing Sonic about, though it is unknown if she was meant to follow Sonic in the game or simply be a subtle plot point relegated to promotional material. The concept art for the character was featured in the compilation title Sonic Gems Collection, although artwork had been on the Internet prior to the game's release. The project manager of Sonic the Hedgehog for Sega of America, Madeline Schroeder, later made the claim that she was responsible for the removal of the character in an attempt to make the game an easier sell in western markets. However, this was later contradicted by Yuji Naka, who, when recalling the development process, explained that Madonna never went beyond the concept stage primarily because of the stark comparison her presence would have made between Sonic and the Super Mario Bros. series. Having a heroine who would be kidnapped and subsequently rescued by the hero of the game was such a cliche at that point that Sonic Team wanted to focus on the battle between Sonic and Eggman. The idea of a hedgehog/human romance was eventually pursued in the game Sonic the Hedgehog (2006) through the character of Princess Elise, with less than stellar results. At the same time the idea for Madonna was on the drawing board, the team also briefly considered having a slew of various living beings fight against Sonic, ranging from a six-fingered hand to a demon-like entity. In the earliest demo for the game shown off at the 1990 Tokyo Toy Show, it is known that the large-jawed enemy went as far as being made into sprite form, with the light-blue Sonic able to attack him the same as any other enemy. In the end, however, everyone agreed that the mustached-fellow was still the best of the lot, and far closer to what they wanted to accomplish with the game, only Sonic and Eggman being fully fleshed out and placed into the final product. Madonna in various poses daydreaming of a certain blue hedgehog. The Sonic the Hedgehog Band. Aside from the animals he saves, no friends join Sonic during his exploits in the first game. This was not always the case, however, with multiple characters (in addition to Madonna mentioned above) being drawn up by Naoto Ohshima and others. Sonic was at one point set to front a music band as the lead vocalist, visible as part of a fully-fledged sound test selected from the title screen, where Sonic would break-dance to the music. Due to time constraints, the concept was scrapped, with a no-frills alternative becoming part of the hidden level select screen as a replacement. The extra space designated for these sound test graphics was given to the "SEGA" jingle heard in the beginning of the game (which had been used in Sega TV advertising since 1983), which took up nearly an eighth of the cartridge space. Mach the Rabbit (on drums) was left on the cutting room floor, and while rabbit characters have been added to the series since, none have taken inspiration from Mach. Max the Monkey (on bass guitar) was never seen again. Sharps the Parakeet (on lead guitar) is thought to have morphed from an earlier scrapped design of Sonic. Development on a bird character continued until around 1994 (after the release of SegaSonic the Hedgehog but before Chaotix), but not as a musician. Vector the Crocodile (on keyboards) is the only "successful" band member. His design was refined for use in the serialised Sonic the Hedgehog manga in 1992/1993, and became playable in Chaotix, before returing to the series in 2003 with Sonic Heroes. Members of the band did appear (in various colours) in early promotional material and the first volume of Sonic the Hedgehog Story Comic, albeit alongside many other unnamed characters and the later (smaller) animal friends. Later editions of the Sonic the Hedgehog archie comics series have also referenced Sharp, Mach and Max, though this was many years after the concepts came to light. While the band were scrapped, early material still has Sonic get behind a microphone, most notably the credits to the Master System and Game Gear versions of the game. The comic also features a side-story in the final volume about an American author from the 1940's who wrote a series of children books staring Sonic the Hedgehog, inspired by her husband. A pilot, he was part of the project to have a human being break the sound barrier for the first time, which unfortunately ended in tragedy. The legend of the man who wore the Sonic-branded jacket faded away until the embodiment of Sonic appears to save a woman caught in an airshow accident in the 1980's. Though interviews with the game creators only a couple months before its release mentions this alternate story while clearly defining it as fictional, the Chuck Yeager-inspired tale was never incorporated into the gameplay, or even mentioned in its accompanying manual. 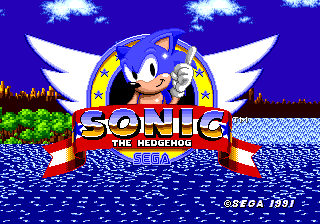 The distinctive "ribbon, ring, and stars"-styled title screen used in the first Sonic the Hedgehog and subsequent installments was something of a theme in early Sega games. 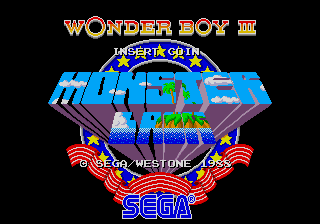 While difficult to prove, inspiration likely came from the title screen from the 1988 Sega arcade game Wonder Boy III: Monster Lair, which bears similarities to that of the 1986 Sega arcade game Alex Kidd: The Lost Stars. The "wings" may hark back to Ohshima's insterest in aviation emblems, being a feature of medals awarded to American air force service personnel since the second World War. The "SONIC" text is attempting to emulate the "chrome" design seen across numerous logos across the 1980s and early 1990s (including the Mega Drive console itself). This trend is usually attributed to the 1979 film, Mad Max. The following is a collection of images drawn up by Naoto Ohshima during the production of Sonic the Hedgehog during the zone creation process. Text Translation: Metallic kind of stage... The background is styled like south-east Asia, golden country, (...) (are) gold colored plating. Alternate scan of the stylized loop art not used in final. Text Translation: Rocky mountain and underwater stage... Japanese styled rocky mountain stage, with underwater scene. In the map, spin (jump) and you can cross the water, but various techniques make it possible to (...) the course. Concept art of a Marble Zone-esque area. Text Translation: Stage where the land shakes... The underground has an amoeba shape and the ground shakes. The amoeba shaped terrain (...) with canals. Can also dive into the ground. Another piece of concept art resembling another area of Marble Zone. Concept art of what appears to be Labyrinth Zone. Concept art marked as belonging to Star Light Zone. Alternate scan of previous two images. Concept art of a Scrap Brain Zone-esque area. Published in SPEC, this concept art shares similar features to the early Green Hill Zone demonstration at the 1990 Tokyo Toy Show, including the trees in the foreground, the blocky area underneath the mountains, and even Sonic's pose. The title screen from the Tokyo Toy Show demo. Similar to the final, it lacks a background, making it appear more like the 8-bit version of the game. The first glimpse of Sonic the Hedgehog in video game form was at the Tokyo Toy Show in June of 1990, which also happened to be the first time the game could be played by the general public. In a retrospective interview with Yuji Naka, it was revealed that the original Sonic Team put together a small, playable technical demo for the show featuring Sonic in an early version of the Green Hill Zone. Though development had just begun, this first known build has some advantages over the final version of the game, possessing seven layers of parallax scrolling, with trees and rocks in the foreground being independent from the clouds and other objects in the background, all separate from the scrolling of Sonic the Hedgehog as he ran through the hilled terrain. Being the earliest representation of the Green Hill Zone, it is also reflective of what was found in early materials used both internally and in promotional articles. One of the most prominent differences between this version and the final are the strange blue structures in the background, though it is unknown if they are meant to represent a city or are simply a natural yet surreal rock formation. With both trees and giant rocks in the foreground which presumably had layers of scrolling independent of each other, the entire style was indicative of what was to come. Though foreground items were not found in the final, the rocks would be modified and used in the released layouts of the game, transformed into downsized, colored purple obstacles in the final release. The clouds of this early pre-release are also bigger, seemingly appearing with less frequency than in the mainstream product. Of note is that in the interview, Naka claims that this tech demo was planned at one stage to be included in Sonic Mega Collection, but was never in any build as the ROM has since been lost internally at Sega. An area which is presumably the start of the stage. Sonic's standing pose is also different to that seen in the final game. A peculiar "Welcome" sign is spotted, though the poor quality photograph renders it unreadable. It is thought to say "You Are Welcome Sega Sonic," and has a picture of a palm tree in the top right hand corner. A unused enemy can be seen here. It appears to be the purple enemy with a large jaw seen in early concept art for the game. Japanese message in the background. Translates to "debut approaching". A higher quality screen of the concept enemy. Sonic in midair with his running sprite. It is unclear whether Sonic is jumping or was hit by the enemy. A close-up of an early Sonic. A still from the playable demo of Sonic the Hedgehog from CES 1991. Visible are the flashing Eggman monitor and a decidedly different version of the Ton-ton. These two short clips uncovered by community member drx feature footage taken at the Winter Consumer Electronics Show in Las Vegas during January of 1991. The footage recorded features numerous differences even in the first level of the game. Among that which is noticeable are the flowers in the level being purple instead of green, the word "RING" instead of "RINGS" in the HUD, and the brief appearance of an Eggman monitor which goes unused in the final game. A higher-quality version of this footage, lacking the frame blending present in the original, later surfaced here - this version has been slowed down to half speed to allow easier analysis. The monitors seen in this footage seem to be cycling through different power-up icons - in the footage available, the first monitor which appears can be seen to change between an Eggman icon and a Sonic icon, and the second monitor cycles through the first and second frames of static, and finally to the Eggman icon just as it disappears off-screen. Each frame seems to be displayed for around half a second before changing to the next in sequence - as the player doesn't break either monitor, it's unknown whether the effect of the monitor was intended to be dependent on which icon was displayed when it was broken, or if the programming for the monitors had yet to be finalized and this was simply a test routine for displaying the various different power-up icons. There are also examples of an earlier Ton-ton enemy that attacks in a similar fashion to the Ganiganis found in the final version of the Green Hill Zone, throwing a projectile on either side as opposed to the single shot they fire in Scrap Brain Zone. Concept art for this variation of the Ton-ton can be seen within the Japanese Sonic the Hedgehog manualMedia:Sonic1 MD JP manual.pdf. Also of note is that a form of the debug mode is active in the clips, the numbers in the lower right hand corner corresponding to debug values. Sonic's position is represented differently by the debug mode in the final game. The full video from which these clips are from can be viewed here. An interesting aside is that while visually the Green Hill Zone is slightly different from the final version of the level, elements such as the purple flowers and the strikingly close water/sky shades of blue in this build did make their way in the finished version. The flowers make an appearance in the final moments of the game after the player has fought the final boss, while the similar shades of blue in the sky and water appear in the title screen. A still from the brief video footage of the early Sonic the Hedgehog, containing a monitor displaying one of the two static frames and the early version of the Ton-ton badnik. A magazine screenshot of this build. The differences are less evident here, though debug mode is turned on. The following is a collection of images published in a variety of sources used to advertise Sonic the Hedgehog and to comment on its progress. Though it is unknown at what point these shots were taken during the development process, each come from a point before the final release. A near final title screen with "Press Start Button" text on-screen. An earlier level select. The levels are placed in their original order. Final zone is not listed and Xs are listed after some levels. The "Press Start Button" text is visible once again. This screenshot is from a later version, as Moto Bug badniks are present. The HUD still reads "RING" and the flowers are still purple. Debug mode, with the player transformed into a ring. A rolling ball. This can still be found in debug mode but is not placeable. The sprite was reused for the zone's boss. Sonic giving the rolling ball a push. Seems you could balance on it. The ball again. The accompanying caption claims it can be pushed, but can also kill the player. The ball again, but this time it is in the air. Alternative version of the above image. More spikes here than in the final game. From the back of the US game cover. You will never find an invincibility monitor on top of a loop in the final game. Sonic punching the air after completing the act as an early end level celebration. The sprites, though unused in the final game, still exist within the ROM. Another map, complete with rolling ball. The layout is otherwise identical to the final game. After being hit, Sonic gets knocked back more than in final. In the final game, every loop in Green Hill Zone has a monitor on top. This one doesn't. Assuming this is still act 3, this later build does have a monitor on top. This shield monitor is not here in final. An extremely early Marble Zone featuring strange level graphics and falling tiles which can be balanced on. This is almost certainly a mock-up. Same image but from a different source, plus noticeable TV scanlines. This magazine printed it the other way around. While likely a mistake, we can't say for sure what the correct orientation is. One of the main features of the prototype Marble Zone was the existence of rotating UFOs in the background. All traces of these graphics are removed in the final game (though a single frame appeared in the mobile phone port of Sonic 1). Spikes badniks used to roam Marble Zone, but were later replaced with Caterkillers. They can still be placed in the level via debug mode. Picky also doesn't appear in this level in the final version. Different lava, but final debug mode HUD position. Footage of the UFOs rotating can be seen in the film Wayne's World during a promotion for "Noah's Arcade." Also the lava in the bottom right is similar to that of the mock-up screenshot earlier. The UFOs would eventually make their way back as a bonus in the debug mode for the 2013 mobile remake. Seen on the back of the US game cover. More UFOs and Spikes badnik. Inside we find that the green pillars haven't been installed in this early build. The background torch is also not lit and the lava graphics are different. This different build sees the addition of pillars, but the torch is still unlit. These infamous "sideways spikes" appear in a lot of Sonic promotional material, but were replaced with moving blocks in the final game. The code and graphics for these objects still exist within the ROM, but they're a awkward to navigate and lack any assoicated sound effects. The background torch is still unlit. The first switch of act 2 is missing on the right hand side. While it is possible to trigger Sonic's balancing animations here in the final game, Sonic will be positioned a few more pixels to the left. A lit background torch, but a room that doesn't exist in the final game. Spikes and Picky must have been removed late in development, as despite now having a final HUD, they're still roaming around here in act 2. Originally called "Sparkling Zone," this shot shows off the original background to the level. The sign behind the HUD says "good luck". Same again. The sign on the right says "GOGO". At one point there was a giant set of rotating spikes in this area, most likely removed due to the difficulty of avoiding them. Spikes still visibly implemented in a late build of Spring Yard (note "RINGS" instead of "RING"), from page 3 of the Sonic the Hedgehog (flyer). You can see the buildings are merely made up of colorful horizontal lines. There appears to be a "Goodbye" sign too. The stage is clearly "sparkling" - rotating palettes seem to be in effect. Strange sign with Kanji written on it. There's more to the background buildings than just horizontal lines. An unknown area, though judging from the time counter, it might be near the start of Act 2 or 3. A sparkle can be seen over the "good luck sign" indicating the sparkles moved around and weren't part of the background. A Moto Bug (found only in Green Hill Zone in the final game) and a purple Roller. A heavily edited screenshot containing the signs found in this early build. Labyrinth Zone once had a completely black background and was littered with different, smaller crystals. This may be the underwater version of the black background. Sonic's palette is the same as above water. The intro to Act 1, sporting a later "rocky" background. There is no water to be seen and the crystals are different. Water has yet to be placed on this slide. More of the rocky background. In the final game this area has water and a spike on a chain, but it's largely empty here. Even more of the rock background. Balancing further up. The ceiling crystals were removed in the final game. Star Light Act 1 has 3 rings missing from the start of the level. This layout is different to the final game. The top row of springs here are missing in final. Debug mode appears to be active. All is fairly normal here, apart from the "RING" in the HUD. A small map, showing one of the loops. Originally known as "Clock Work Zone", the title card at the beginning of the zone displays erroneously as "Clock ork Zone" due to the lack of a "W" character in the font used. This initial platform is similar to the final game, but there's one big issue - the background is the same as the foreground. The level appears to be devoid of objects, and it doesn't take long to find differences in the layout. In fact, very little of this layout is similar to the final game. The starting area turns up a lot in these screenshots, suggesting the level was quite short at this stage of development. ...diagonal conveyor belts. Though horizontal ones made it to the final game, the diagonal ones are absent. Diagonal belts again. The closest to these in the final game are the conveyors with spinning platforms. Tile placement is clearly unfinished. ...and yet magazines kept showing it anyway. A zig-zag tunnel with debug mode enabled. Sonic emerges from a tunnel. 2 minutes and 6 seconds down the line and Sonic has yet to receive any points or rings. Also the background does not appear to be scrolling that much (if at all). A special stage level with a layout not seen in the final game. More of the different layout. Magazine staff seem to have struggled with this stage. Numerous publications had access to this prototype, and yet almost all of them printed parts of the initial section. Tectoy decided to print this on the back of the Brazillian box. It makes the stage look empty. In this shot, it almost looks as if bricks have been placed at random. In France, television advertisements for Sonic the Hedgehog, aired around the time of release, show extra graphics that are not present in the retail game. It remains a mystery whether these were added by marketing or genuinely come from a Sonic prototype. Translations were also created for Portugal. One advert shows a wrecking ball for the Green Hill Zone boss, but its animation appears to be much more advanced, with an added sparkle that circles around the ball giving it a greater sense of movement. “ Mega Drive by Sega. Now also with two controllers and 4 spectacular games, including Sonic! Sega, it's stronger than you. Mega Drive, the 16-bit console with most worldwide sales. Another advert showcases an unseen behavior of the spring in Marble Zone, seemingly extra long when used, and when bumped into the two blocks behind it disappear. “ Well... are you angry? It's me, master Sega. So you're choosing Sonic. Let's go. And you're gonna laugh, because you're not even at the half of the game. This page was last edited on 21 March 2019, at 18:11.